A Greenshank and 7 Whimbrels were among the waders on the 29th. There were no new migrants to report from the 30th, but the long-staying Western Bonelli's Warbler was seen once again at Holland House. A Crossbill was the bird of the day on the 27th, when a couple each of Swift and Sand Martin were the only other sightings of any note. 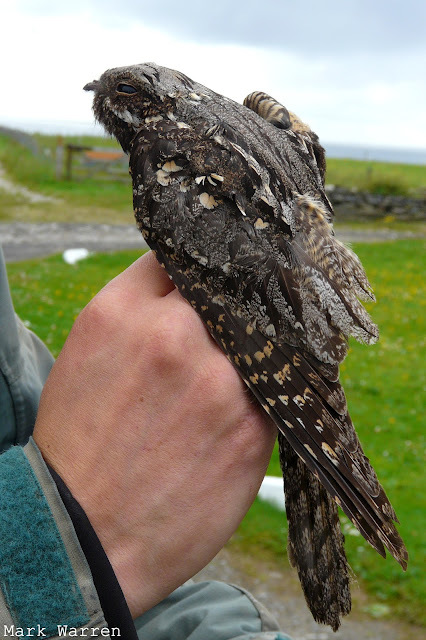 With the gears of landbird migration still struggling to reengage in autumn mode, a timely jump-start in the fantastic form of a Nightjar was a most welcome surprise on the 28th and easily one of July's highlights. Originally flushed from near the observatory, it soon flew into one of the mist nets and provided a rare opportunity to see one of these bizarre nocturnal goatsuckers at close quarters and in broad daylight. The year's first Hobby a Kestrel and a Hen Harrier were all new raptors in the afternoon, and a Sedge Warbler ringed at the observatory was either an early autumn migrant or dispersing progeny of one of the island's breeding pairs. Plenty of waders were still to be seen gathered in the freshly cut fields, with 6 Whimbrels among the more numerous species. 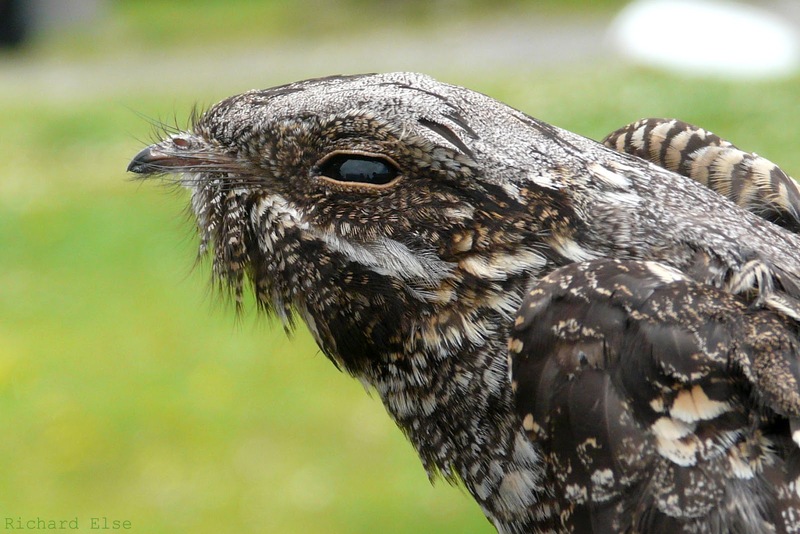 Nightjar: the scientific name Caprimulgus and the colloquial name goatsucker both stem from the curious belief that these birds use their spectacularly wide mouths to suckle milk directly from the teats of goats during the night. The island has only recently acquired some goats, so we will be keeping a keen eye out for any suspicious nightjar activity in their vicinity. The year's first Greenshank finally appeared on the 25th, as counts of other waders included 461 Sanderlings, 390 Turnstones and 77 Ringed Plovers. The Dunlin influx, however, was a short-lived event: most of the birds from the previous day had departed to leave just 68 by morning. The only other species of interest were a couple of Swifts and a flock of 16 Lesser Black-backed Gulls. 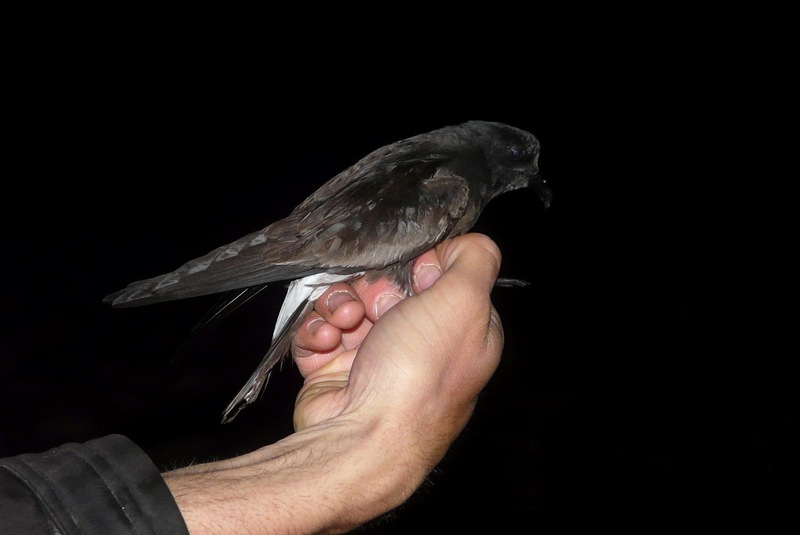 A Leach's Petrel and 51 Storm Petrels were caught that night, while a second Leach's Petrel was seen to be attracted to the tape. The highlights of seawatching on the 26th were 2 Sooty Shearwaters, 5 Manx Shearwaters and 5 Storm Petrels; a Sand Martin was the day's only other noteworthy sighting. Seawatching on the 23rd produced the first 2 Sooty Shearwaters of the year, along with 6 Manx Shearwaters. As waders continued to pass through, a Black-tailed Godwit on the 23rd was followed by a flock of 11 the next day, a mass arrival of Sanderlings numbered more than 400 birds, and an invasion 215 Dunlins took place during the day on the 24th. After a lengthy period of inactivity, there were finally some landbirds to talk about on the 24th: a Crossbill flew south in the afternoon, a Swift and a Collared Dove were both new and, unbelievably, stunningly, the Western Bonelli's Warbler reappeared Lazarus-like in the Holland House gardens after more than three weeks of presumed absence! Compensating for a lack of noteworthy avian sightings, the year's first Basking Shark, seen among a flock of feeding terns Kittiwakes and Gannets off Nouster Bay, was a nice find on the evening of the 20th. After dark, another session of tape-luring petrels resulted in 15 Storm Petrels and 2 Leach's Petrels being ringed at the observatory. There was little migration to talk about from three more days of typical midsummer intermission. The flock of Golden Plovers swelled to 629 birds on the 17th, including one highly distinctive leucistic individual. A Short-eared Owl on the 18th was the first for a few weeks, and the highlights of the 19th were a couple of Whimbrels and a flock of 120 Kittiwakes on the west coast. Ringing activity in the summer usually focusses on Storm Petrels and the island's breeding birds. A small number of Arctic Terns have now fledged, but a search for Black Guillemot chicks among the boulders at Twingness drew a worrying blank, indicating another terrible breeding season for the species. The Ringed Plovers seem to be having better success, and a few of their endearingly cryptic chicks (pictured) have been ringed so far. The very quiet period continuing, passage of anything other than the common waders was exiguous at best, although such dry spells are to be expected in mid-summer. A Redpoll was flying around on the 14th and 15th, a Heron was probably a new arrival on the 16th and 4 Swifts were seen on the latter date. Several separate Arctic Tern colonies were established in the spring, but most of them failed completely last month. 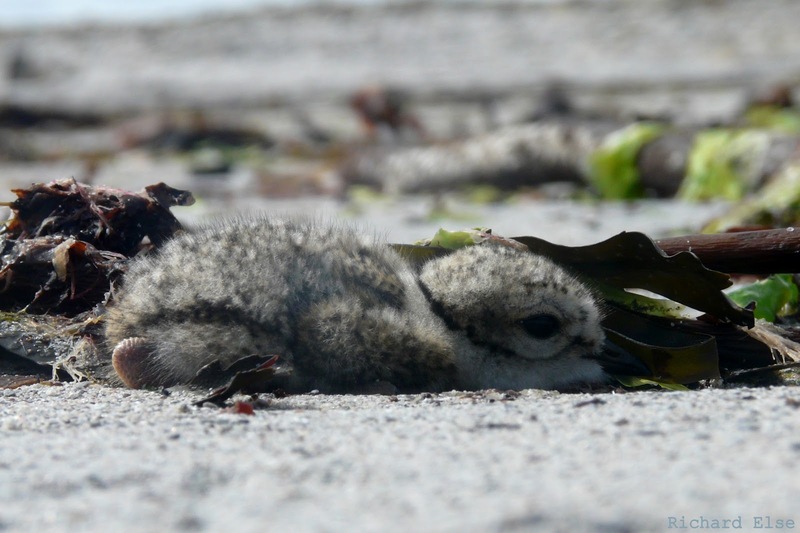 One colony does now contain a few chicks, making 2012 at least a small improvement on last year's complete wash-out. 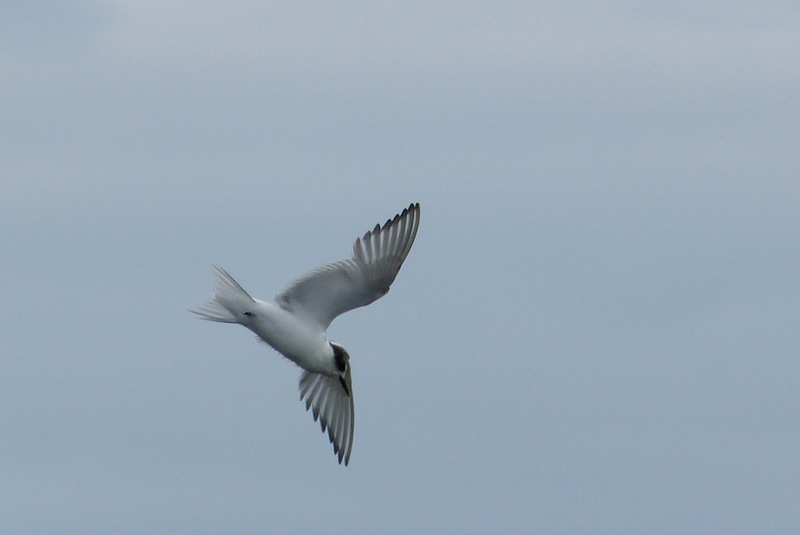 Flocks of terns remain scattered around the island, mostly comprised of failed adults and non-breeding first-summer birds like this one. There was almost nothing of any real note for three quiet days, although the usual wader species continuing to build in numbers included an increase in Golden Plovers to around 400 birds and many flocks of Redshanks, Lapwings and Oystercatchers feeding in the recently cut fields. A seawatch on the 13th produced little besides 7 Manx Shearwaters. Highlights from this period included a Common Tern sitting among the ranks of failed breeding Arctic Terns on Tor Ness on the 9th and 6 Whimbrels and 21 Purple Sandpipers - the first real indication of return migration for the latter species - on the 10th. The year's first nocturnal petrel-ringing session took place late at night on the 10th, resulting in 7 Storm Petrels being trapped. The heavy silhouette of a Leach's Petrel was also seen dodging around the net, but the bird managed to evade capture. A Black-tailed Godwit and a Swift on the 6th were just about the only migrants to report from the 6th; a Spotted Flycatcher, a House Martin and a Whimbrel were the highlights of the 7th. 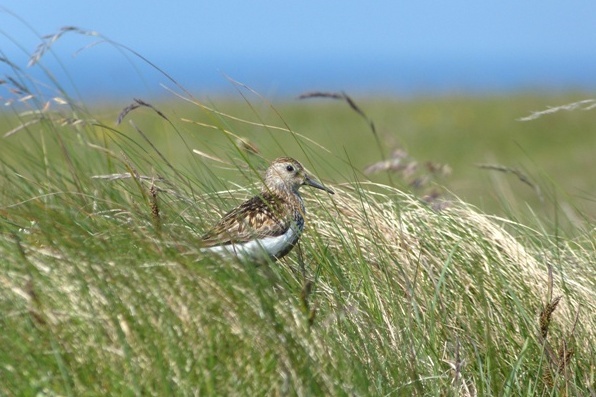 The most notable occurrence was a pair of Dunlins found nesting on the island - the first ever breeding record of the species on North Ronaldsay. Three days of impenetrable mist disrupted nearly all flights to the island and made futile most attempts to count the island's birds. At least 7 Whimbrels were present on the 5th, their calls emanating from somewhere within the atmospheric murk throughout the day; more southbound Golden Plovers managed somehow to blindly navigate their way to North Ronaldsay, with up to 277 birds present in scattered flocks; and a couple of fogbound Common Redpolls were present throughout the period. The Western Bonelli's Warbler was seen briefly during the morning, although it was still very elusive in the Holland House sycamores. A Chiffchaff was the only new migrant in the gardens, a long-staying White Wagtail at Bewan Loch was joined by a new bird, a couple of Common Redpolls were still around and wader movement included 2 Whimbrels and 7 Curlews heading south. A Western Bonelli's Warbler was found at Holland House first thing in the morning, and eventually flew into a mist net early in the afternoon after several frustrating hours of waiting. Prior to its capture it was very elusive and always silent, but biometrics and a distinctive whistled call given upon release finally sealed the identification. This is NRBO's fourth Bonelli's Warbler; of the previous three, one is accepted as a Western bird and two are accepted as Western / Eastern Bonelli's Warbler. 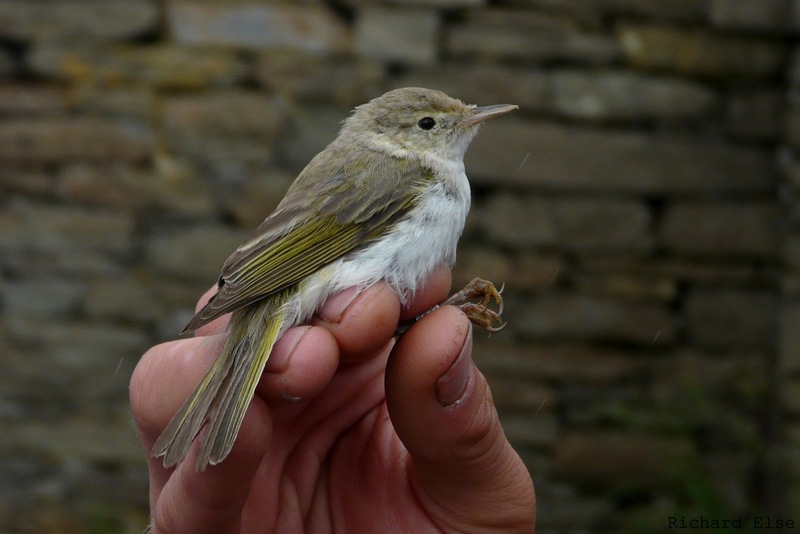 In the hand, all measurements fell neatly into the range of Western Bonelli's Warbler. In the field, though, some features appeared suggestive of the rarer Eastern species. Very grey upperparts and quite pale-looking greater covert edges seemed to fit Eastern, but can probably be attributed to the worn state of the bird's plumage. The only other sightings worth mentioning were a Reed Warbler trapped and ringed in the gardens and 5 Swifts seen in the afternoon. Besides the still-present Marsh Warbler, the only migrants were a Swift and a Siskin.